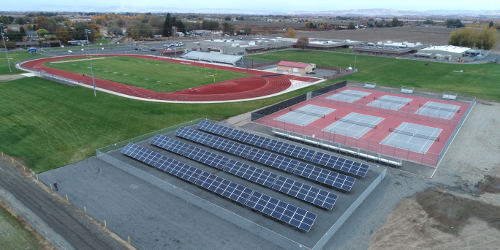 DESCRIPTION: This project was a design/build effort for a 100.8 kW-DC fixed ground mount solar PV array for the Toppenish School District at their High School. The system is comprised of 336 Itek Energy 300 Watt modules. Power is converted by 4 SMA America 24000TL inverters and is connected to the Pacific Power grid at 480 volts, 3 phase. The system offsets their utility usage by 154,000 kWh saving the City almost $16,000 per year. The system will be used for the Science, Technology, Engineering and Mathematics (STEM) program to teach students about renewable and solar photovoltaic energy.